Ever seen Hitchcock’s film, The Birds? Well, I have. And now I cringe every time I see a cloud of birds in the air. So it’s a good thing I don’t live in northern California, where, tomorrow, a battalion of racing pigeons is scheduled to bomb through the skies over San Jose. Thankfully, these guys not targeting humans; they’re collecting information about air pollution with—get this—tiny cell phones, smog sensors, and GPS devices. Each bird (they have names like “Ricardo,” “Laura” and “Scott”) will carry a little backpack stuffed with a $250 array of gadgets for beaming carbon dioxide and nitrogen oxide measurements back to ground control, where the info be broadcast in real time on the project’s Web site. There will also be reporter birds on the scene, equipped with little cell phones and cameras for documenting the occasion. It’s unclear whether a pigeon editor will be stationed at a pigeon news desk somewhere to receive the reports. Anyway, this avian reconnaissance mission, masterminded by UC Irvine professor Beatriz da Costa, is part of a weeklong art and technology showcase called ZeroOne San Jose. And lest you think creating pigeon-sized electronics is an easy feat, you should know that it took da Costa and two graduate students a year to develop the tiny cell phone, GPS device and smog detector. 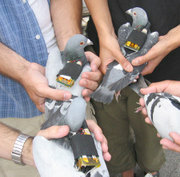 So is it nice to make pigeons haul around a bunch of electronic equipment? The project has received some criticism from PETA (of course), but a spokesperson from Cornell University’s Lab of Ornithology says, “Racing pigeons are high-performance athletes,” and since the tiny backpacks weigh less than ten percent of the animals’ body weight, there’s probably no cause for concern.